AA+ Dynamics Training is committed to helping students and professionals prepare for an exciting career in ERP or CRM management consulting through jumpstart bootcamps and subsequent college and university courses that provide hands on learning and ERP/CRM theoretical foundational concepts. AA+ Dynamics Training is a collaborative organization with Palm Beach Atlantic University, a Microsoft Dynamics Academic Alliance University. AA+ Dynamics Training also partners with other leading Microsoft DynAA schools and partner organizations throughout the world. College Coursework - three credit graduate and undergraduate college courses that can be transferred back to your home institution or combined to earn a degree at Palm Beach Atlantic University. Courses generally satisfy Accounting Information Systems, Management Information Systems, Information Systems/Computer Science or Marketing (CRM) requirements. Microsoft Student Certificates - Students completing the boot camp and one online course or two online courses in Microsoft Dynamics will be issued a Microsoft Dynamics Student certificate from Microsoft. Enterprise Systems Graduate Certificates - Students and professionals that complete four online university courses will be awarded both the Microsoft student certificate and an Enterprise Systems Graduate Certificate. These courses will qualify in most states toward an accounting students 150 hour coursework requirements. The graduate certificate is also a way to strengthen any student's or professional's resume. Dr. Copeland has been training and implementing Microsoft Dynamics solutions for over 25 years. She works with other Microsoft Dynamics Academic Alliance schools to try to increase the opportunities for students. A CPA and university professor, Professor Copeland also teaches ERP, CRM, AIS and Accounting courses and is passionate about helping students and professionals prepare for an exciting career in Enterprise Resource Planning (ERP) or Customer Relationship Management (CRM) consulting. 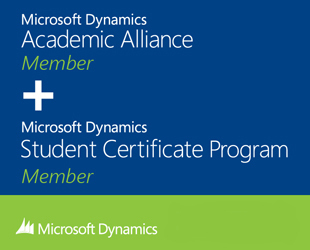 AA+ Dynamics Training, through its partnership with Palm Beach Atlantic University and St. John Fisher College, is a member of the Microsoft Dynamics Academic Alliance program and collaborates with DynAA member universities throughout the world to provide premier Microsoft Dynamics 365 and ERP/CRM training and coursework. Top Tier partners implementing Microsoft Dynamics 365, Axapta, Navision, Great Plains, Solomon and CRM for over 20 years. Top Tier University professors throughout the world.